It's a lovely, cold, rainy day here in Texas. It's one of those days where all you want to do is stay curled up in a big, warm blanket by the fire and read a good book. And that is exactly what I'm doing. I'd like to recommend two books that have caused me a good bit of reflection. I won't say the books are for everyone, but they certainly are worthy reads if you're an avid reader who likes to try a bit of everything. 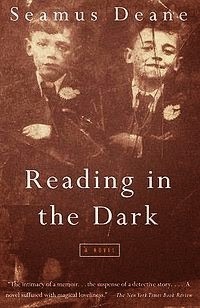 The first book is Reading in the Dark by Seamus Deane. I found it on one of the "Best of..." lists and was intrigued by the title, the author's name (I knew it was Irish), and the photo on the front. 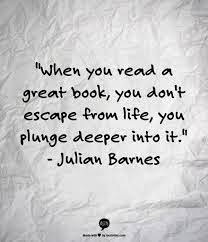 I don't like to read too much about a book before I actually read it, as it's like watching a detailed movie trailer that gives away some of the best parts. I had a feeling about this one, took a chance, and bought the book. I had a feeling it would be one I'd want on my shelf and not just on my Kindle. When I first began reading the book, I didn't think I was going to like it. I was wrong. I loved it. It was like walking into an Irish pub and having the old gentleman in the corner tell you what his life was like growing up in Ireland in the 1940s and 1950s. He would be the kind of storyteller that draws you in and wraps you up in his tale. You might resist a bit, at first, and tell yourself you're just humoring the old man, but by the time you leave the pub in the wee small hours of the morning, you know you'll never see things exactly the same again. You also know you'll carry the memory of that old man with you for the rest of your life and be all the better for it. The second book is one I am still reading. That's right, I'm recommending it before I even finish it. I don't usually do that, but I've gained so much from what I've read so far that if the rest proved to be unworthy, what I've gained so far would override anything I might dislike in the rest of the book (although, I know that isn't going to happen). I have enjoyed the book so much, that I've purposely slowed myself down because I'm not ready to end it. 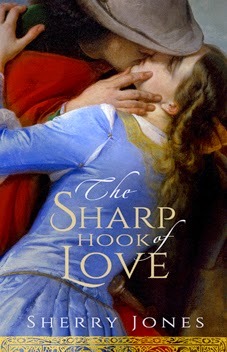 The name of the second book is The Sharp Hook of Love by Sherry Jones. It is a historical fiction about the love affair between Heloise d'Argenteuil and Pierre Abelard in Paris, France, in the 1100s. It is an amazing book, sprinkled with excerpts of the actual letters they wrote one another. This book is more than a love affair, though, it is the meeting of two great minds. It is also a statement on religion, church laws, and the way women have been treated by religion since the beginning of it all. I became intrigued with this book when I knew it was a historical fiction about a real woman who was intelligent and well-educated in the twelfth century. I actually didn't know there could be such a thing as a well-educated woman during that time. Heloise was, indeed, heralded as a "jewel" in her day because women of her kind were very rare. This book has caused me to reflect on many things, aside from the engaging, romantic story of these two well-known people of their time. It would be hard for me to put into words, but I came to understand myself a little better from reading this book. I felt a connection to Heloise. While I wasn't raised in an abbey, as she was, I was "raised in the church" and in religious ideologies. I understand Heloise's confusion and her conflict over finding herself in love with Abelard. I also understand that she loves him with the same profound love and devotion and passion she feels for God. After all, it is from loving God she knows how to love. It is from her religious upbringing she learned that to love fully and completely, she must love unselfishly - no matter what the cost is to herself. Before buying the book, I did a little research and found there is a book of their letters to one another, which I would very much like to read. I tried not to read too much about the real Heloise and Abelard, though, as I wanted to enjoy the novel before discovering what really happened to them both. If you love historical fiction, as I do, this book is definitely a book to put on your list.